Some vimeo.com videos have a download link that allows you to download the video as a file on your computer. If this is the case, use the normal method for inserting a local video file. YouTube videos do not have a download link (you may be able to download the video file from youtube by using the service at http://en.savefrom.net - check that this allowed by YouTube and by the owner). 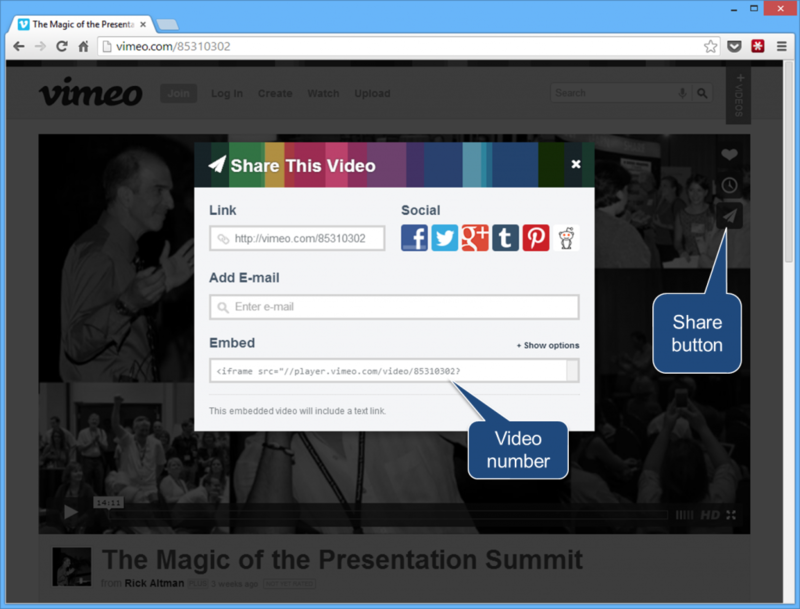 For YouTube videos or when the video owner has not enabled the download on vimeo.com, you can still use the video in your PowerPoint presentation if the owner permits use in presentations and public viewing. The method in this article creates a hyperlink from an image on your PowerPoint slide that starts playing the video in a full browser window on top of the presentation. When the browser is closed after the video finishes, the PowerPoint presentation continues. 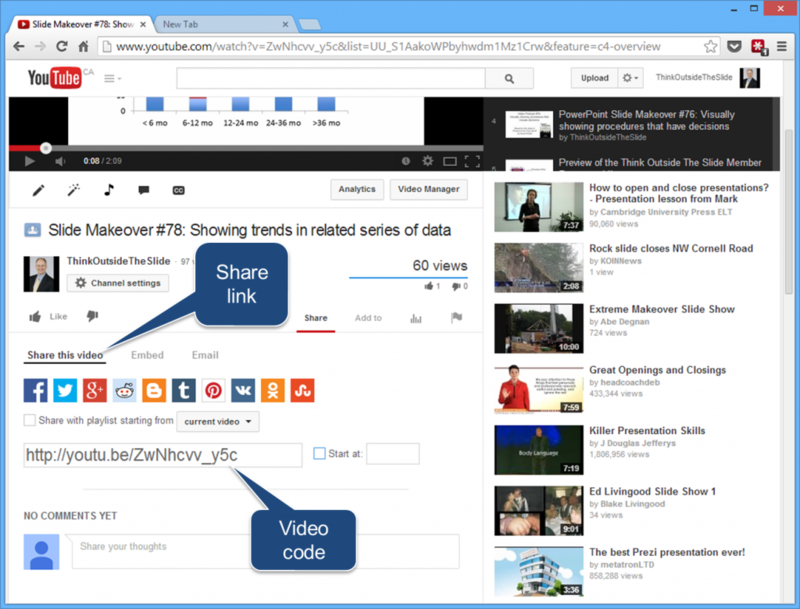 Here are the steps to link to the video from a slide and have it play when the link is activated. Step 2: Take a screen capture of the video page (use PrtScrn in Windows or Cmd+Shift+3 in Mac). Insert the screen capture on your slide. Crop the screen capture so just the video frame is shown. Make the image as large as you want on the slide. Add text to give credit to the owner of the video. Step 3: Select the image and add a hyperlink to the image. For videos on vimeo.com: The hyperlink web address is http://player.vimeo.com/video/<vidnum>?autoplay=1 where <vidnum> is the video number on vimeo. You can find this number by clicking on the Share button on the vimeo video page. It is after the "vimeo.com/". This link, when activated, will open a browser window and start playing the video in the full browser window. For videos on youtube.com: The hyperlink web address is http://www.youtube.com/embed/<vidcode>?autoplay=1 where <vidcode> is the video code on youtube. You can find this code by clicking on the Share this video link on the youtube video page. It is after the “youtu.be/”. This link, when activated, will open a browser window and start playing the video in the full browser window. Before starting the presentation, open your default browser and make it full screen. Test that you can access a website so you know the Internet connection is working. Close your browser so it will open full screen when opened with the hyperlink. In Slide Show mode, to play the video, activate the hyperlink on the image by clicking on it with your mouse or by pressing Tab, then Enter. 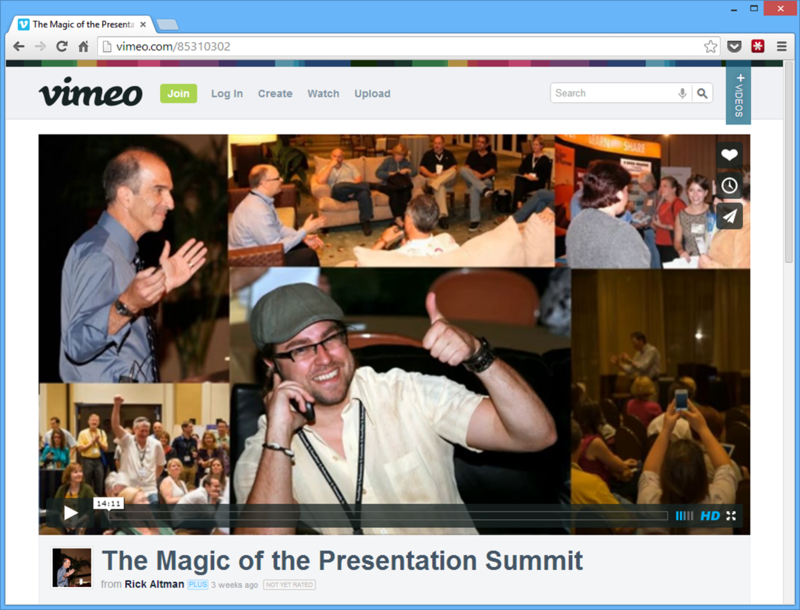 The browser will open on top of the presentation and the video will start playing full sized in the browser. (If you double-click on the image, you may start the video playing behind the PowerPoint presentation. If this happens, use Alt+Tab in Windows to switch the active application to the browser window with the video.) If you want to remove the browser scroll bars and toolbars, you can press F11 in Internet Explorer or Chrome. The only way to remove the task bar at the bottom of the screen is to set it to automatically hide itself in the operating system. When the video has finished playing, close the browser using the red X or using Alt+F4 in Windows. You will return to the slide that started the video. You are now back in the presentation. Note: This method uses the embed code provided by vimeo.com and youtube.com at the time this article was written in February 2014. The sites may change these codes at any time, which may break this method. 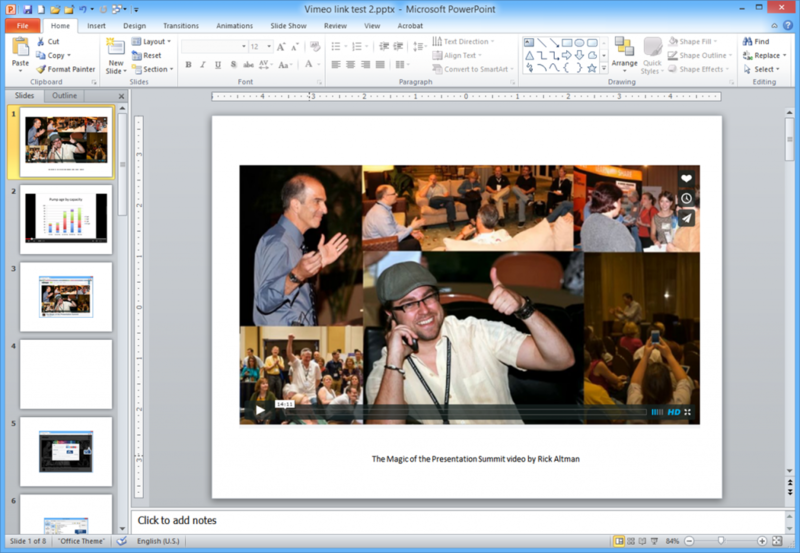 This method may work in other presentation software, but has only been tested in PowerPoint. For those who don't mind getting a little more technical with PowerPoint, John Wilson has this tutorial on how to embed a video from Vimeo or YouTube into a slide as a Flash object.